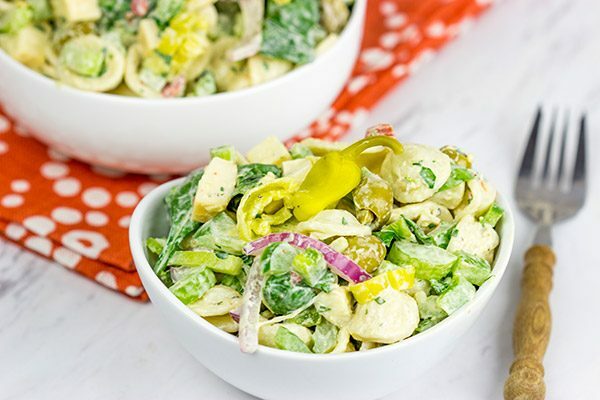 This Smoked Mozzarella Pasta Salad has a secret ingredient: pepperoncini! 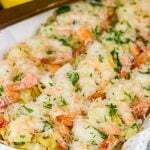 This recipe is a delicious way to celebrate summer picnic season! I don’t know how to make a small pasta salad. Seriously. Every pasta salad that I make typically involves me pulling all of my largest storage containers out of hiding. I think it’s because most of my pasta salads start with a 16oz. box of pasta. I mean I could weigh it and make 8oz. of pasta. But then I have a random half box of pasta hanging out in the cabinet. Then you consider all of the chopping. If I’m gonna stand there dicing peppers, celery, etc…then why not just keep on going? That way I’ll have enough pasta salad for the neighborhood picnic and enough to keep some for us! And then you throw in the fact that pasta salad is delicious…yeah, that double batch is necessary! As we head into another fun summer filled with water balloon fights, playing on the swings in the park and a healthy amount of grass mowing, pasta salad is a requirement. Today’s Smoked Mozzarella Pasta Salad includes a secret ingredient. Well, two…although I’m not sure the smoked mozzarella can be called secret since it’s in the title of the recipe. The secret? Pepperoncini. For years, pepperoncini were just those little peppers that came inside Papa John’s pizza boxes. (Why they include pepperoncini with their pizza is still kinda strange to me…but whatever!) But then last summer, a friend made a pasta salad with sliced pepperoncini in it. Woah! 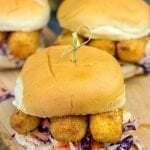 Talk about a fun twist on a classic summer picnic fare. Picnic pasta salads often get a bad rap…and rightfully so. Too often, I find that pasta salads are covered in mayo…and that’s just not how I like to roll. So for this Smoked Mozzarella Pasta Salad I used some sour cream to cut the mayo. And then I used an extra-secret ingredient…pepperoncini juice. I often use a bit of vinegar in my pasta salads, so I figured why not use some of the pickling vinegar from the jar of pepperoncini? Combine that with the smokiness from the mozzarella cheese, and you’ve got one delicious summer pasta salad. Picnic win! 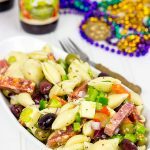 I used orecchiette pasta as a way to mix up this Smoked Mozzarella Pasta Salad a bit. 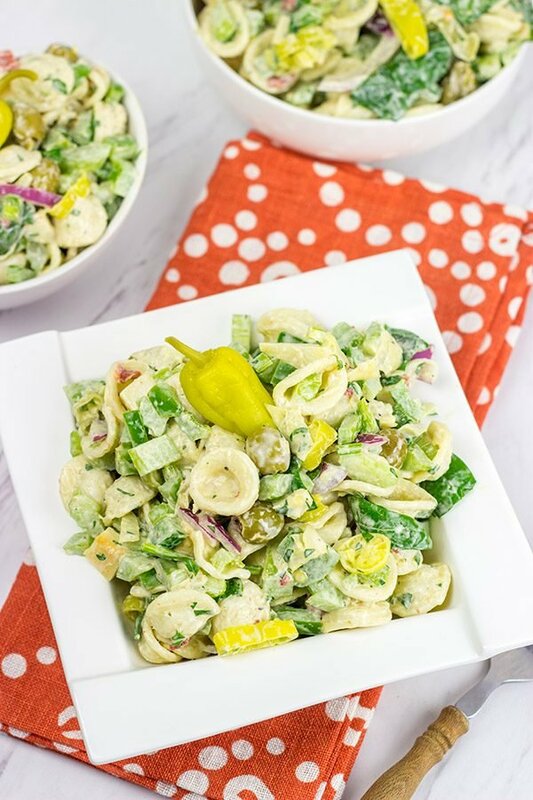 Fun fact: orecchiette is Italian for ‘little ears.’ Now you have some fun trivia to bring to the summer picnic along with this tasty pasta salad. Enjoy! Do you have a favorite summer pasta salad? Cook pasta according to package instructions. Rinse and drain the pasta in cold water. 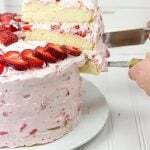 Refrigerate for 2-3 hours, or until cold. Meanwhile, make the Dressing by whisking together all ingredients until well combined. Before serving, add Dressing, spinach and mozzarella cheese; stir until well combined. Keep salad refrigerated; serve cold. If you can’t find cubed smoked mozzarella, check the deli counter. Also check the specialty cheese section of the grocery store. I found 8oz. blocks in my store, and I just diced them at home. Of course, non-smoked mozzarella can be used if smoked mozzarella isn't available. 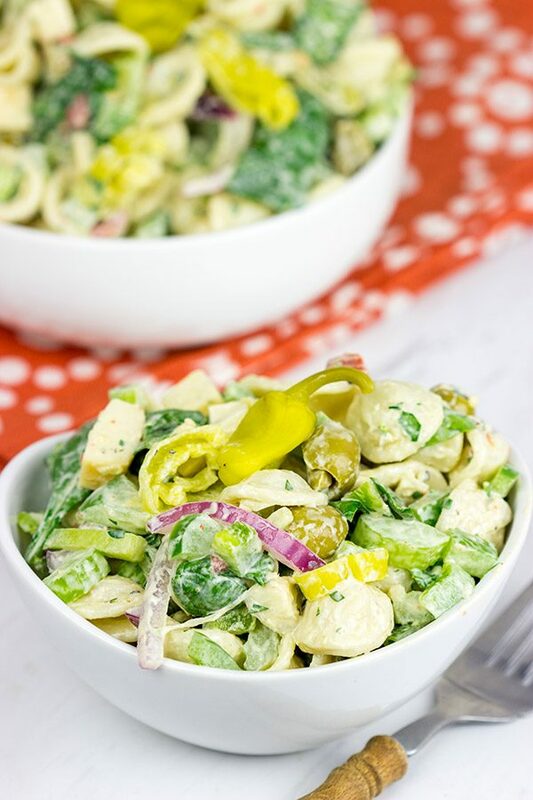 Love the idea of adding pepperoncini to a pasta salad! And the juice!! Here we bake them in olive oil and sea salt in the oven and eat them as a side with, well, almost everything. I´m defo going to try this one! When are you guys heading to Germany?? Oooo…baked pepperoncini?? That sounds incredible! I don’t think I’ve ever come across anything like that, but I’m going to have to try that out sometime. The vinegar-y addition to the pasta salad here is so tasty, too. Oh, and we head out in a couple of weeks to Germany…not too much longer now! 🙂 Thanks for remembering! See! I’m glad someone else understands my dilemma when it comes to pasta salad. I’ve made small pasta salads before with a 1/2 box of pasta…and I’m always just disappointed. I like my pasta salad to last for a couple of days of yummy deliciousness! (Or just 1 huge party…either way.) 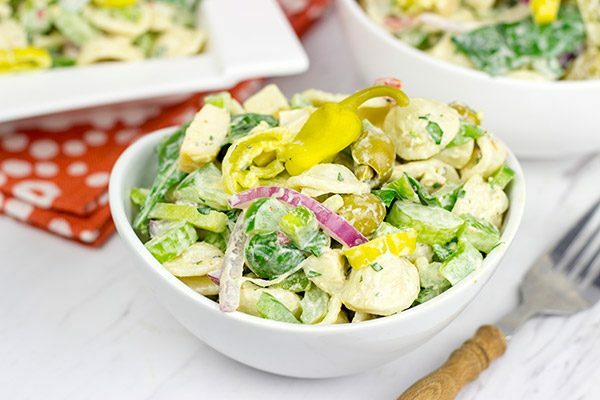 So the pepperoncini are totally a fun addition to this pasta salad. The vinegar-y bite plus the smoked mozz is so addicting!! Thanks, Dawn! 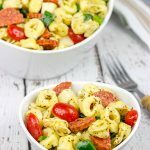 My all-time favorite pasta salad is this tortellini thing my mom used to make every Fourth of July. It was good, but your salad is definitely giving it a run for its money. This has everything I love in it! For real, I’ll take down half a jar of pepperoncini in one sitting. And artichoke hearts happen to be my all-time favorite food :). I love that this makes a big batch, too, because leftover pasta salad makes a perfect breakfast. Have a great week, David! “this tortellini thing” Hmmm. Could you be more specific, Kelsie? 🙂 So pepperoncini in a pasta salad is totally my new secret weapon! The vinegaryness (that’s a word…I promise) is so addicted, and then the smoked mozz is so tasty in addition. Mmmm. Pasta salad. Thanks, my friend! This pasta salad looks utterly fabulous, David! However, there’s one rule I’d like to remind you – there’s no such thing like “too much pasta salad”. Also, as another rule says, “If you still have too much pasta salad, send the leftovers to Ben”. I think these 2 rules totally make sense, don’t they? Also, this salad totally makes sense to me too. There are two things about it which make me love it. Firstly, it’s a pasta salad. Secondly, the use of smoked mozzarella. I don’t need any more reasons to try it. Besides, I love that you used a dressing in a very moderate way – there’s nothing worse than a pasta (potato) salad submerged in tons of dressing. Well done! Hahaha! I like your rules, Ben! And I agree with you. Pasta salad is just meant to be made in large batches. A small batch of pasta salad is just sad. It disappears way too fast and leaves me wanting more. So I say just make a big batch from the start! 🙂 Smoked mozz really is the best, isn’t it?? I do have several favorite pasta salads! hehehehe But this smoked mozzarella does intrigue me! I would love to have a big old bowl of your salad right now! Oh, I have several favorite pasta salads, too, Gaila! The problem is making sure I make them all at least once during the summer. 🙂 This smoked mozz + pepperoncini version is definitely a new favorite though. I foresee it showing up again very soon. Haha! Thanks so much, my friend! Pasta salads are so much fun! And for me, a good pasta salad is the best summer appetizer ever! 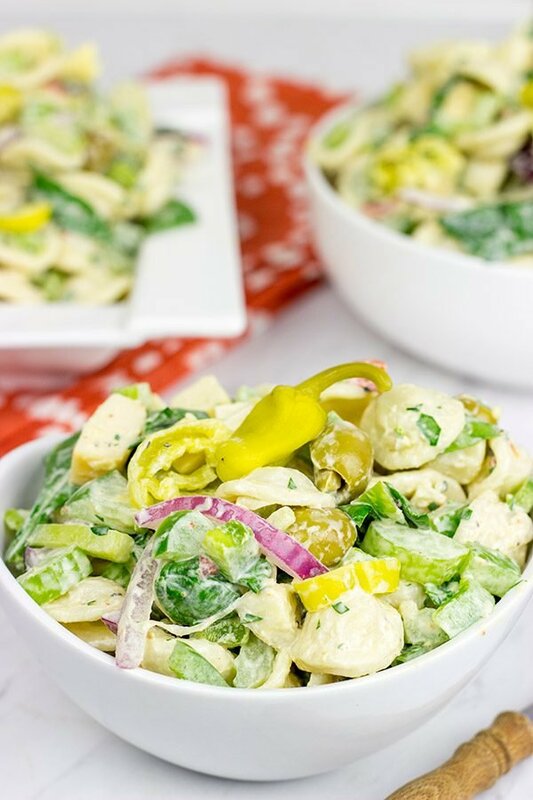 🙂 So if you’re already a fan of pepperoncini AND smoked mozz, then this pasta salad is absolutely calling your name, Mary! Make it this weekend for a fun summer recipe. Mmmm…pasta salad! Thanks so much, my friend. I hope your week is off to a great start so far! I’m a huge fan of pasta salads David so this getting pinned, as for Lynne and I it would make a fantastic packed lunch for work. Easy to make the night before for dinner and plenty left over for the next day. Just what I’m looking for. I’m also extremely grateful for how you’ve used sour cream to cut the mayo. I’m always looking for ways to reduce that and that’s a great idea! Yes! Pasta salads do indeed make such good lunches for weekdays. That’s part of the reason why I like to just make big pasta salads right from the start. So I found that reduced-fat sour cream is a great way to cut some of the mayo in pasta salads. (You could probably use plain Greek yogurt, too.) It’s got a nice tang, but cuts a lot of the fat out, too. We didn’t miss the mayo at all! Thanks, Neil! I’m all about the flavors in this salad David!! And too funny, I immediately thought of my college Papa John’s days when I saw the whole pepperoncinis. That and their garlic sauce were regular late night friends 😉 This sounds amazing!! Oh man, those late night pizzas with friends in college. I’ll never forget ’em! In fact, my roommate freshman year got into this habit of ordering a pizza every.single.night and eating it while watching the late night comedy shows. Yeah, that was a different time. Can you imagine doing that now?? 🙂 But I will gladly nibble on this pasta salad as a snack at midnight. Hah! Thanks, my friend! Ha! I always make a ton of pasta salad and you had me thinking about that ginormous Tupperware bowl that doesn’t quite fit in my cabinet. You know, the white one with the blue lid? I never complain about too much mayo on anything, but I love your creativity with the pepperoncini vinegar! Oh, I know exactly what tupperware container you’re talking about! In fact, I have two of ’em. They nest nicely inside each other…but the cabinet doesn’t shut unless I position ’em just so. And it drives me nuts!! Hilarious. (Or hilariously annoying…) Thanks, Rachelle! Oh, this is one super tasty pasta salad, Puja! The smoked flavor from the cheese combined with the vinegar flavor from the pepperoncini is quite fun. Do give it a shot sometime this summer! 🙂 Thanks so much! I love eating pasta salad. This one is great. I love that you added pepperoncini in this pasta salads. I love eating pepperoncini. This is perfect for any summer salad! I hear you about not being able to make a small pasta salad (or soup for that matter!) I’m always teetering on overflowing the bowl / soup pot! 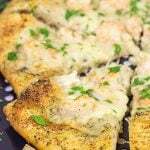 The flavor combination you have going on here sounds amazing – and love that tangy heat of pepperoncinis! Haha! Man, you should see our kitchen counter whenever I make a batch of pasta salad. I have every plastic container out trying to figure out how to store it all! 🙂 For me, pasta salads are just one of the best things about summer. 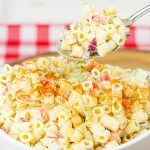 I love grilled food, but you’ve gotta have pasta salad right there with it! Thanks so much, Marissa. I hope you have a great weekend, my friend! I’m not sure I’ve ever had smoked mozzarella. The salad sounds wonderful.